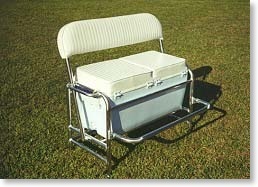 Pro-Line's cooler holder seatback is second to none and may be one of the most valuable additions to your boat. The seatback may be used as leaning post or adjusts for fore and aft seating. The framework elevates the cooler, providing a comfortable seating height with easy cleanup, and allows for storage below. The upholstery is high-density foam with heavy-duty marine vinyl in white or grey. It comes ready to mount, and can be easily shipped. Custom models are available. Visit NewWater Boatworks, Proline's sister site!